Dr. Ghobrial has no disclosures relevant to this article. Dr. Austin has disclosed that he receives research funding from Zimmer. A 55-year-old female patient presents with a 1-day history of right shoulder pain and weakness that started when she reached behind her car seat to grab her purse. She has had intermittent, mild right shoulder pain for the last 2 years, but she had not sought any medical treatment for it until now. The patient complains of posterolateral shoulder pain, weakness with external rotation, and an inability to perform activities such as reaching behind her head. She denies radiation of pain, numbness, or tingling. She has no significant medical or surgical history. No swelling, ecchymosis, focal tenderness, or obvious deformity of the right shoulder. 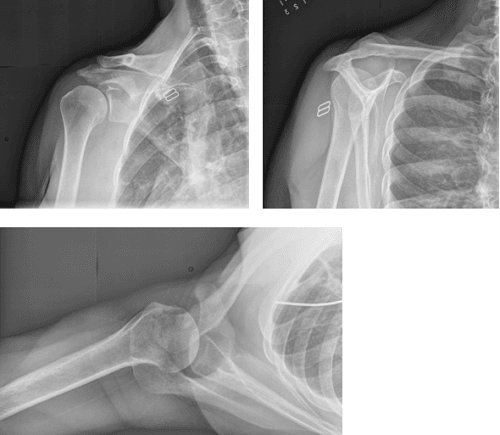 As recommended by the authors, the patient agreed to undergo a right shoulder arthroscopic suprascapular nerve decompression by evacuating a spinoglenoid notch cyst and repairing the one-way valve in the posterosuperior labrum. 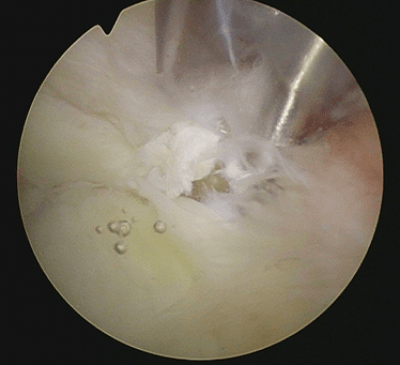 Repair of labral tear closes the 1- way valve and prevents future cyst formation and nerve compression. The patient was placed in the lateral decubitus position with 8 pounds of arm traction. 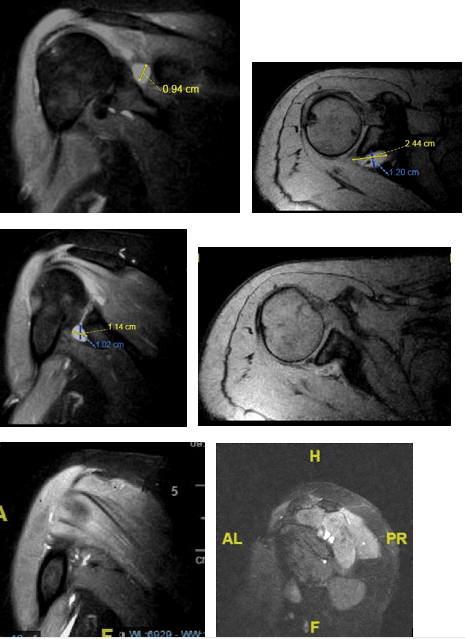 Using a posterior and anterior portal, a diagnostic arthroscopy was performed which demonstrated a posterior labral tear with intact biceps anchor (Figure 3). 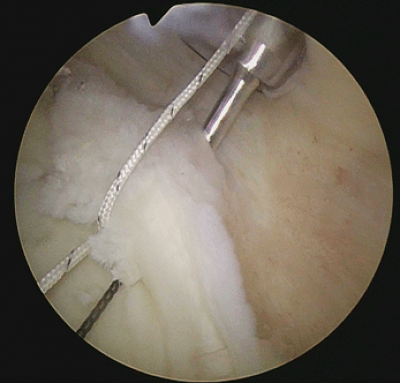 An arthroscopic tissue liberator was used to elevate the labrum and potentially decompress the cyst. 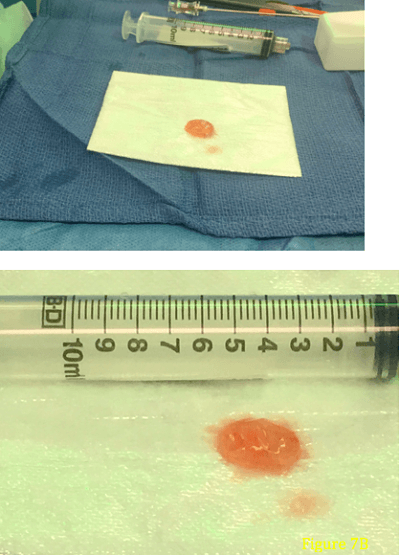 However, the cyst was unable to be fully accessed and decompressed with this method (Figure 4). A third anterosuperior viewing portal was created and the anterior and posterior portal were cannulated. 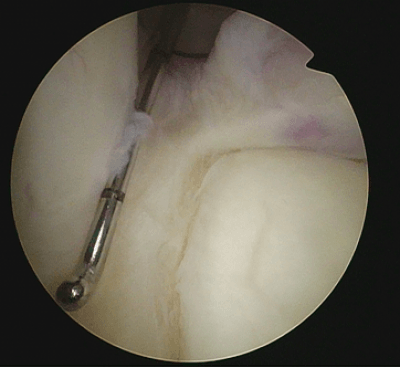 The posterior labrum and glenoid rim were rasped and prepared for repair. The indication to repair the labrum is to close the one-way valve and stop the flow of joint fluid into the spinoglenoid notch cyst (Figure 5). Two Bioraptor Suture Anchors (Smith & Nephew; Andover, Massachusetts) were placed in the posterior glenoid. A suture lasso (Arthrex; Naples, Florida) placed through the posterior portal was used to pass suture around the labrum. It is imperative not to grab the capsule and instead simply compress the labrum to the glenoid. The sutures were then tied through the posterior portal in the standard fashion. 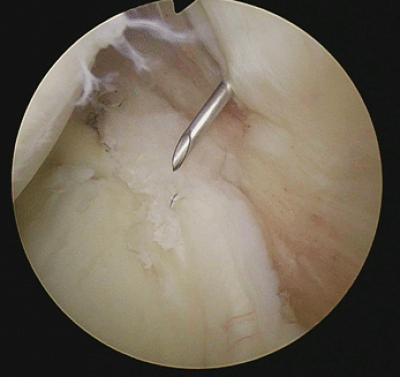 Once the labral tear was repaired, an 18-gauge needle was inserted under arthroscopic-assisted visual guidance, into the posterior capsule at the site of the repair to decompress the cyst (Figure 6). Gelatinous fluid (1 mL) was aspirated from the cyst (Figures 7a-b). Figure 3. Posterior labral tear. Figure 4. The cyst cannot be reached with an arthroscopic tissue liberator. Figure 5. Posterior labrum repaired. Figure 6. An 18-gauge needle is used to decompress the cyst. Figure 7a-b. Fluid aspirated from the cyst. The patient tolerated the procedure well, without any complications. She was placed in a sling and discharged home from the PACU with instructions to remain non-weight-bearing. Mark Ghobrial, DO, and Luke S. Austin, MD, are from The Rothman Institute, Philadelphia, Pennsylvania. Previous articleWhat Are the Options for Managing Pelvic Discontinuity?